in Google Earth with this KML or on the Catlin Arctic Survey website. They have a bundle of communications tools with them, and they'll be sending back regular video updates directly from the ice as well as photos and the scientific data that they collect. 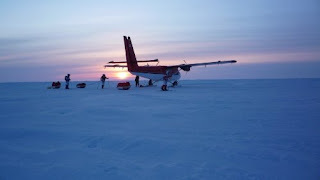 About two weeks ago, a team of explorers was dropped off in the Arctic, ready to embark on a 100 day journey across 1000 kilometers of disintegrating and shifting sea ice. They're traveling on foot, hauling sledges in temperatures ranging from 0ºC down to -50°C, and conducting scientific experiments as they go. If you don't have quite the same tolerance for cold weather, you can still follow along with the team in Google Earth with this KML or on the Catlin Arctic Survey website. They have a bundle of communications tools with them, and they'll be sending back regular video updates directly from the ice as well as photos and the scientific data that they collect.